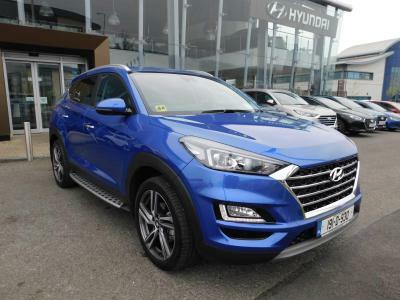 The All New Hyundai Tucson is back in the Irish market, available now from Michael Barrable in Dublin. With a new chassis, engine and gearbox, the brand new model gives you comfort, safety and efficiency, with a quality style making it one of the best looking SUV’s on the market. The Hyundai Tucson follows the quality style of other Hyundai models, design to look like its moving while it’s stationary. The new chassis also gives you a comfortable drive, easily dealing with potholes and other imperfections on the road. The soft suspension also adds to your comfort, and thanks to its body control it won’t roll when turning, with 16-inch alloys adding to the style of the SUV. The interior of the Hyundai Tucson also allows you and your passengers to travel in comfort. It’s roomy enough to fit four 6 footers easily with lots of headroom, and the doors open to allow easy access for everyone. Storage is also great for long trips or hobbies, with 513 litres available with the back seats up & reaches up to 1,503 litres when they’re folded over. The dashboard is also neat and organised, with easy to use dials and a great infotainment system, with Bluetooth allowing you to stay connected or listen to music through your Smartphone. Safety is also a key feature, with six airbags protecting you if the worst happens, making it ideal for families. Blind spot detection, rear cross traffic alerts and automatic emergency brakes are also available, making it one of the safest SUV’s on the market. If you have any questions you can call Michael Barrable on 01 8833300 or use the “Contact Us” form below and one of our friendly staff will be happy to help you. You can also drop into our Hyundai Dealership where you can browse the Hyundai range and choose the best option for you.